Public Safety, Commercial Radio or Business Two-Way, each type of radio transmitter site needs continuous power to operate reliably. 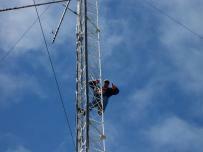 NYSSP has experience with primary site power systems and emergency standby power at communications sites. Rely on the experience of our engineers and technicians to integrate a total power solution to your new site, or to retrofit / update an existing site. Our extensive understanding of the unique requirements at RF sites has made us the #1 choice of Public Safety Agencies, Commercial Radio Stations, and Private Business alike. Trust your power to the Professionals! NYSSP uses the latest technology in conjunction with proven industry standards to design & implement your system. Total system surge protection and comprehensive grounding techniques ensure that your site is reliable in even the worst weather. To ensure durability, NYSSP adheres to the National Electrical Codes and Motorla's R56 standards for design and installation of your system. Is your local Elecrical Contractor familiar with R56? Knowledge is Power & Experience is Success. Is your grounding system adequate? Your electrical power reliable? In addition to design and installation capabilities, NYSSP provides comprehensive site maintenance services for emergency backup generators, utility power components and distribution, underground utilities, surge suppression, comm. shelters, grounding components and fencing. In conjunction with our associates, we provide a total solution to your site maintenance needs. Call us for a complimentary inspection. ...to better serve you and to keep our operation running smoothly during power outages & emergencies, New York State SitePower Corp. maintains its own business two-way radio network. NYSSP's takes reliability and communication seriously. Unlike cell phone service that isn't guaranteed to work when the power is off or when the system is overloaded, you can rest assured that when the others fail, we'll still be in action, on the road and in service for you with reliable communications. We take great pride in the fact that we will be there when you need us most regardless of what the competition is doing; Our service IS the difference! How is this done? We own, control and maintain our secure business two-way radio network consisting of multiple conventional and trunked repeaters placed strategically throughout our service area to ensure reliability and redundancy. By partnering and developing relationships with the communications industry customers we serve, they benefit from fully installed, maintained, and monitored 24-7 backup power at their communications sites. 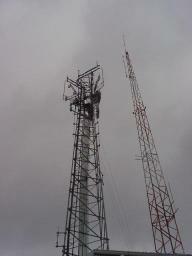 In exchange, our radio equipment is co-located at their tower sites; a win-win situation! Learn how other tower owners and communication site managers have realized the power of teaming with NYSSP. Contact us today!